Discussion in 'Online Games - News and Reviews' started by Marina, Apr 9, 2018. When it comes to online gambling entertainment, everyone has their own taste in gaming. Big Time Gaming software group and try out the new Extra Chilli Megaways slot game that launched this week. This is an exciting new offering by the innovative Big Time Gaming (BTG), with the chance to land 117,649 betways across the five reels and 6 rows of the game. When you hit one of the rewarding bonus features, things start to get hot, hot, hot. Will you be able to handle the heat of wilds, feature drops with win reactions or free spins with win multipliers? Firecracker Wilds: The wild symbol in this game is the Firecracker and will stand in for all other symbols (except the scatter) to complete winning combinations. Extra Reel: This feature adds a symbol to the reel below on reels two, three, four and five. Reactions: Each winning symbol forms part of a ‘reaction’, which is replaced by symbols that come from above on the reels, as well as from the right in the extra reel. Free Spins: To grab yourself eight free spins in this game, you need to line up the letters H, O and T (to spell HOT) as the scatter symbols. During the free spins, if you land more scatters, you’ll earn up to four extra free spins. In the free spins round, you will earn the Unlimited Win Multipliers feature which begins at one and then continues to increase with every new ‘reaction’. Feature Drop: This allows you to buy the feature you desire at any time… for a price of course! The feature can be bought for the price found in the Feature Drop button. Should the price be reduced to zero, the feature will trigger automatically. extra spins or the other gambling features. On the other hand, this game is perfectly tame enough for players who simply enjoy sticking to smaller amounts and spinning the reels. The beauty of this slot is that it caters to players across the board. 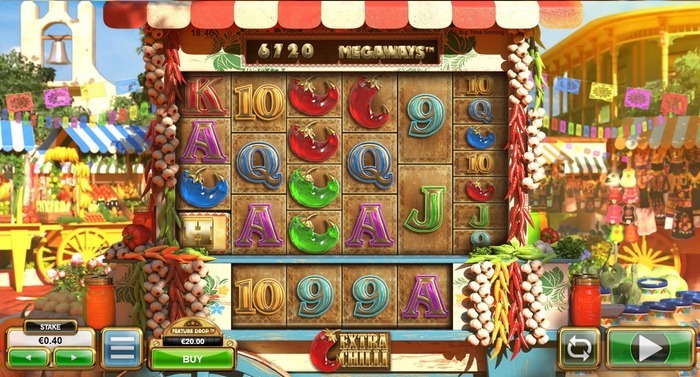 a great look and non-stop entertaining, we are sure that Extra Chilli Megaways slot will become a huge hit among players.